... as I return back from Greece ... and as I am still under the holiday spell I will try and recreate a dish that I consider the epitome of Greek food. Gemista! It's been a while since I put a blog post, so please bear with me as I try get back in the groove! I have been cooking quite a bit since my return from Ballymaloe but I haven't had the motivation or patience to put up a blog post ... the effort always seemed a bit too much on every given day! It's probably down to the truncated nature of the last few months, a few weeks in Dublin, a few weeks in Luxembourg, another few weeks in Corfu, Greece with a few days in the Lot valley in the South of France ... it's been a bit difficult to get up a head of steam! Anyway I'm back to it now and decided that a Greek dish would be the most appropriate for my first post back after Ballymaloe ... fair warning ... there may be a few more in the coming weeks as I struggle to settle back into Luxembourgs weather! While I love traditional Greek & Mediterranean food, I particularly enjoy the modern spin a number of restaurants are putting on this freshest and tastiest of food. The choice of book was obvious for this post, Mazi, modern Greek food! 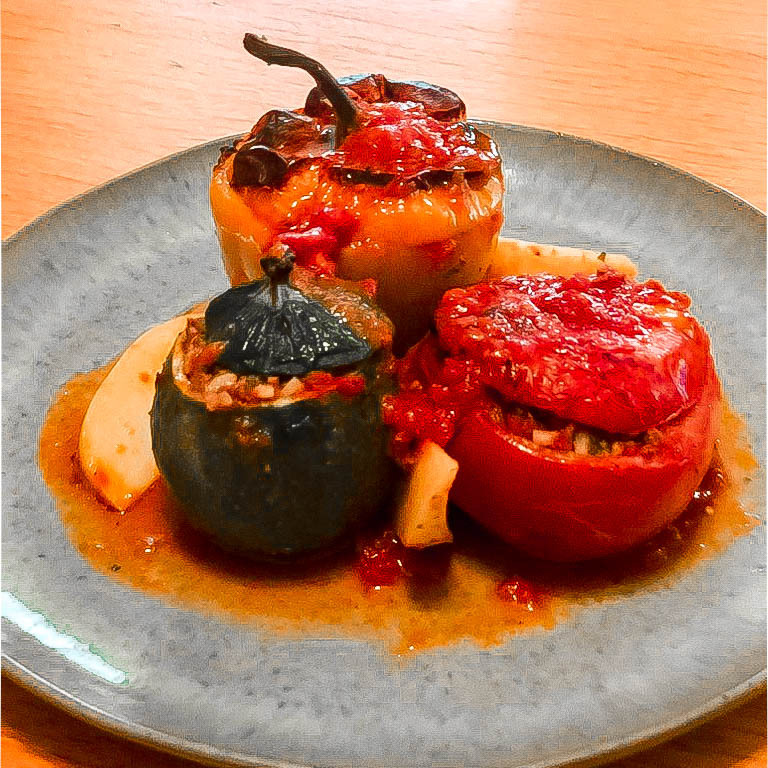 Mazi is a modern greek restaurant in Notting Hill, London that I have followed on instagram since 2015! I haven't had the pleasure of visiting yet ... next time Pokefamily!!! I was going to try do something fancy from the book but I thought their version of this all-time classic would be more appropriate. This is a great version of Gemista and very similar to the one that a Greek close to home cooked for me ONCE!!! For the filling, heat the the oil in a large sauté pan over a high heat, add the onions and garlic and sauté for about 3 minutes until softened but not browned. Add the minced beef and cook, stirring and breaking up with a wooden spoon, until well browned and it starts sticking to the base of the pan. Season with salt and pepper. Then add the red wine and continue cooking until the wine has evaporated. Add the chopped tomatoes, tomato purée, sugar and finally the parsley. Reduce the heat and cook for a further 20–30 minutes. Remove the pan from the heat, add the rice and mix well. While the filling is cooking, cut the top off each of the aubergines, peppers and tomatoes, reserving the lids, and scoop out the insides. Discard the core and seeds of the peppers, (reserve the aubergine flesh for another dish). Place the tomato flesh in a large bowl. Using a tablespoon, fill the vegetable cavities with the minced beef mixture. Return each vegetable to its original position in the roasting tray and then replace their lids. For the sauce, add the canned chopped tomatoes to the fresh tomato flesh in the bowl along with the olive oil and a good seasoning of salt and pepper. Mix well and then pour in between the stuffed vegetables, covering any gaps, but not on top of the vegetables. Bake for 1½–2 hours until the vegetables are soft, turning them around every 20 minutes so that they cook evenly without burning on one side. 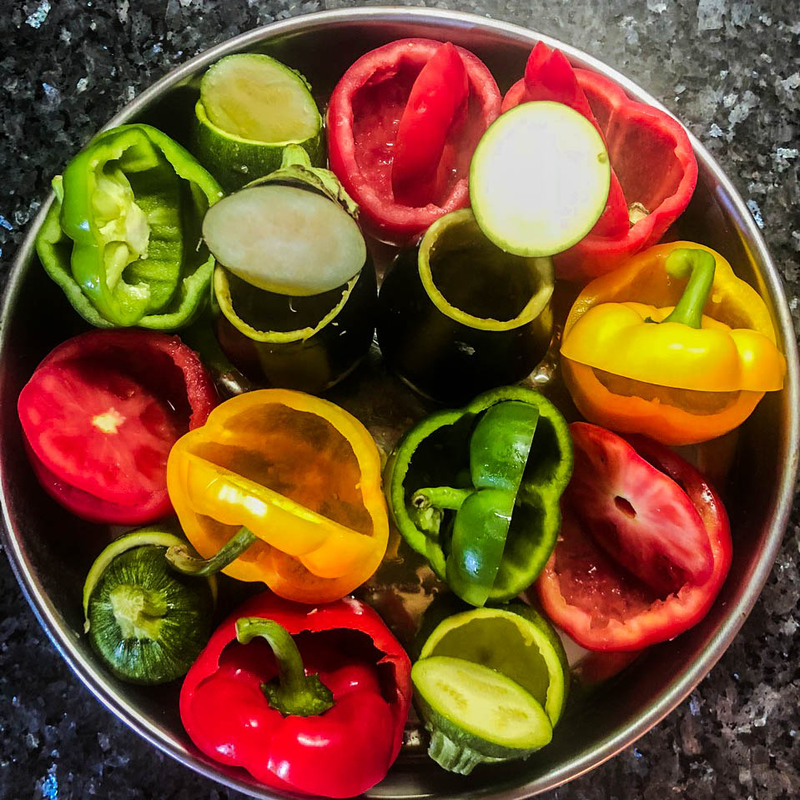 Depending on the strength of your oven, they may be ready a little sooner – the key is to keep an eye on how the vegetables are doing and turn them regularly. Serve once the vegetables are done. Note ... when you are scooping out the veg ... keep the aubergine and courgette insides and use the following day ... (as suggested in the book ...sauté with garlic and parsley, add some tomato sauce and serve with pasta, or use in a risotto).